The 1st (Royal) Dragoons was stationed at Potchefstroom, South Africa when Britain declared war on Germany in August 1914. The Regiment was recalled to Britain and landed at Southampton on 19 September 1914. The 1st (Royal) Dragoons landed in Belgium in October 1914 as part of the 6th Cavalry Brigade, 3rd Cavalry Division. The Regiment served with this Brigade and Division for the duration of the First World War. The 1st (Royal) Dragoons saw heavy fighting during the First and Second Battles of Ypres and was frequently rotated in and out of the trenches. If you’d like to learn more about the Regiment and its role during the war I can recommend downloading the war diary and viewing the regimental history which I have discussed below. Start off with my generic British Army Research Guides especially those concerning Medal Records and Abbreviations and Acronyms. I’d recommend downloading the two war diaries and looking at a copy of the regimental history. Officers: Start by trying to find a service record but not all have survived to the present day. If a record has survived it will either be at the National Archives or if an officer served past April 1922 then it will still be held by the Ministry of Defence. I offer a copying service for officer’s service records held at the National Archives. I have written an article to help you order records from the MOD. The war diaries of the 1st (Royal) Dragoons contain the names of many officers and a newspaper search is always worthwhile. My articles on British Army Lists, London Gazette and Hart’s Army List will help you. 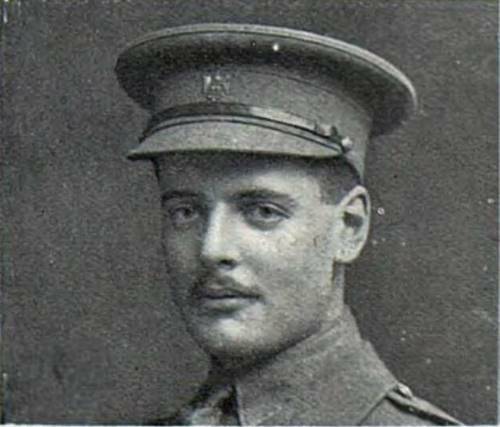 Lieutenant Arthur Herbert Burn 1st (Royal) Dragoons who was killed in action at Ypres on 29 October 1914. There is a service record available for Burn at the National Archives: WO 339/11195. This photograph was taken from The Sphere which is an excellent newspaper to search if you’re looking for an officer who died during the war. The Sphere has been digitized and can be viewed on FindmyPast. Other Ranks: A service record is the key document to find but many were destroyed in the Blitz. If a soldier served past January 1920, then their record should still be held by the Ministry of Defence and I’ve written an article to help you here: Ordering a Service Record from the MOD. Medal Records are a good place to start and you’ll want to search newspapers and the war diary of the Regiment as it contains the names and regimental numbers of hundreds of other ranks, including most casualties. I have transcribed some casualties at the bottom of the page. If you’re researching a soldier who served in the First World War then you’ll need to search the records on FindmyPast and Ancestry. Both sites offer a free trial period and you can often access them for free at your local library if you live in Britain. Clicking on the banner below will take you to FindmyPast. There are two war diaries for the 1st (Royal) Dragoons and both have been digitized by the National Archives. To download the war diaries for a small fee click on the blue links below. Notes: A good war diary for 1914 which recorded the Regiment’s casualties by surname. 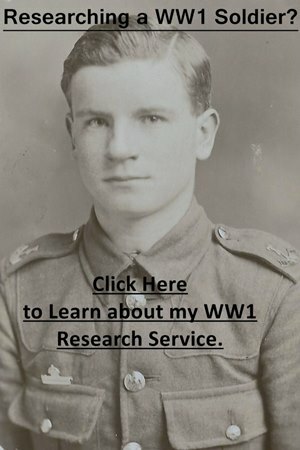 The war diary is still better than most after 1915 and there are a number of interesting appendices including a copy of the diary of Lieutenant J. H. Leckie which covers the period between October 1914 and 3 May 1915. There is a list of casualties with regimental numbers sustained between 12 and 14 May 1915 (over 100 names) and casualties recorded after the end of each month, often with details regarding their wound up until the end of 1917. Notes: A typical post-war diary where very little happens. The entire war diary is typed and British officers are mentioned throughout. There is a large regimental history which covers the Regiment’s First World War service: History of the Royal Dragoons, 1661-1934 by C. T. Atkinson. This book which was published in 1934 has been reprinted by the Naval and Military Press. Microfilm copy (339 pages) of the war diary of C Squadron with additional notes by Brigadier S. C. Dumbreck who served in the squadron from February 1916: Documents.9615. An 18-page letter book written between April and July 1914 by the commanding officer of the Regiment informing the Kaiser of its activities. Also, a letter from the German Military Attache acknowledging the receipt of letters and a September 1914 copy of The Eagle, the regimental journal: Documents.12546. Photocopies (202 pages) of letters written by Captain William Henry Jepson St. Leger Atkinson who served as the Regiment’s signalling officer and cover the period between October 1914 and May 1915 when he was killed: Documents.11875. Microfilm copy of the memoir of G. W. Albin who served with the Regiment after the war “late 1920 – March 1922”: Documents.10757. Below is part of the casualty list for the 1st Dragoon Guards for the 2nd Battle of Ypres on 13 May 1915. I haven’t cross-referenced the soldiers below with their Medal Index Cards so there may be errors in the original appendix. 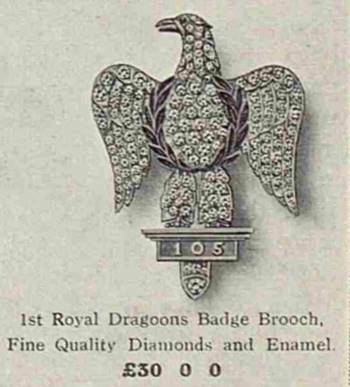 A sweetheart brooch for the 1st (Royal) Dragoons which was available for the princely sum of £30. Sweetheart brooches were common during the war and it’s always worthwhile being on the lookout for them in period photographs.